African-American Publishers Announce ‘State of Emergency’ in U.S. 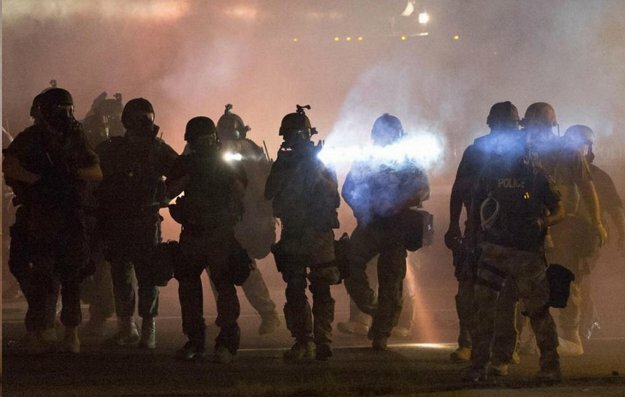 The National Newspaper Publishers Association [NNPA], the nation’s largest trade association of African-American-owned newspapers and media companies, recently declared the existence of a police brutality state of emergency in the U.S. with respect to Black America. And during a press conference on Friday, Sept. 23, the leaders of the organization who represent a collective of 211 Black-owned newspapers in 32 states with a reach that extends to 20.1 million readers per week, said they intend to raise their voices in solidarity while issuing a list of four recommended action items that they’ll deliver to President Barack Obama, U.S. Attorney General Loretta Lynch and members of Congress. Further, as expressed during the announcement made at the National Press Club in Northwest DC, NNPA Chairman (and publisher of The Washington Informer) Denise Rolark Barnes, Bernal E. Smith II, NNPA Board of Directors member and publisher of The New Tri-State Defender and NNPA President and CEO Dr. Benjamin F. Chavis, Jr., said in a joint statement that the time for talk has long ended. “Millions of our readers across the nation are once again outraged at the latest fatal incidents of police brutality in Tulsa and Charlotte. These are not isolated incidents but [rather] a deadly national pattern of police violence and prosecutorial misconduct. A state of emergency now exists in Black America,” they said. Two other activists from the District, Black Lives Matter D.C. spokesperson April Goggans and Richard Brown, a returning citizen often called upon to address the concerns of others like him who face similar forms of injustice and discrimination, also spoke during the press conference. In a statement issued several days after the press conference, Chavis stated the following. “The NNPA is receiving numerous statements of endorsements of our declaration of a national police brutality state of emergency. We note the support of our four demands from the National Bar Association [NBA] and the Congressional Black Caucus. Millions of Black American families have been traumatized and hurt by the growing fatalities of Blacks at the violent hands of a system of law enforcement gone mad with racial hostility. The NNPA will continue to advocate for effective remedies,” Chavis said. Kevin D. Judd, NBA president, said the members of his organization support the NNPA’s declaration and efforts. “For years since Trayvon Martin, the NBA has mourned the deaths of all the folks killed by police while unarmed. We have people, lawyers and students, in places across the country like Charlotte, who are serving as protest monitors and pro bono attorneys – a practice that we will continue as long as it’s necessary. We are going to take all of the steps we can in terms of legal support to help stop this violence and to eradicate this state of emergency,” Judd said. “One has to wonder why the New York bomber, the shooter in the Birmingham church and even the recent shooter in a D.C. mall were all taken alive while Black men whose cars have broken down or who have been involved in an automobile accident tend to wind up dead. We need prosecutors to value and represent black and brown lives with the same vigor that they’ve used to put our kids in jail,” said Crump, who represented the family of Trayvon Martin in the case against his killer, George Zimmerman, and who now represents the family of Terence Crutcher, the 40-year-old Black man recently shot and killed by Tulsa police officer Betty Shelby. The NNPA has submitted four action items upon which they urge the aforementioned group of U.S. political leaders to immediately act. The list includes: appoint a special federal prosecutor on police brutality; establish a national police oversight commission on the use of deadly force, with training and cultural sensitivity; create a national police brutality and misconduct database accessible to the public; and establish tougher federal penalties for police officers and prosecutors who violate constitutional rights. Rolark Barnes said their actions mirror those of Blacks from the past including Ida B. Wells, a reporter and activist, who lobbied U.S. leaders with vigor because of the brutal practice of lynching Blacks. Smith said he has personal reasons for his concerns – his children. “I have two sons and I have frequent talks with them about how to stay alive. The conversations I regularly have in my hometown of Memphis often address the fears of Black men who feel like they – like we – are under siege. The statistics confirm our fears. Driving, walking or even sitting while Black can be life-threatening. Chavis added that while American leaders have issued their condolences to the hundreds of families who have lost loved ones at the hands of police, nothing substantive has been done. “There has been no change in the reality of Black Americans. We can no longer be silent nor can we allow external forces to divide us. The publishers who are members of the NNPA intend to let our political leaders understand that we are disgusted and that those running for office must respond if they want our vote. At the same time, it seems that too many of our own people have gone to sleep on this issue. We plan to wake them up,” he said.